Discover the website Waldorfish where my guest post about covering the hoop house and the magic of nasturtiums gives a peak into why I love teaching gardening. This hearty lasagna is perfect for that transitional time, when late-summer produce is winding down and the first fall vegetables appear at farmers’ markets. Combining yellow squash, zucchini, and mushrooms, the dish comes together quickly, with a ready-to-use pasta sauce. In this dish, I used butternut squash pasta sauce being offered by the local grocery store and the results were spectacular. Please feel free to use whatever store-bought sauce that you like for this satisfying dish. Preheat an oven to 450°F Line a baking sheet with aluminum foil. In a bowl, stir together the ricotta, Parmesan cheese, egg, sage, 3 tablespoons of the parsley. oregano, garlic, and season with salt and pepper. Set aside. In a large bowl, toss the yellow squash and zucchini with 1 tablespoon of the olive oil, and season with thyme, salt and pepper. Arrange in a single layer on the prepared baking sheet. Transfer to the oven and roast until tender and lightly browned, about 15 minutes. In a separate bowl, toss mushrooms and 1 tablespoon of the olive oil, and season with thyme, salt and pepper, Place in a large cast iron skillet and transfer to the oven and roast until tender, about 10 minutes. Meanwhile, in an Dutch oven over medium heat, warm the remaining 1 tablespoon olive oil. Add the onion and cook, stirring occasionally, until softened and lightly browned, about 15 minutes. Transfer to a bowl and add the yellow squash zucchini and mushrooms. Reduce the oven temperature to 400°F . Spread 1/2 cup pasta sauce in an even layer on the bottom of the Dutch oven. Arrange a single layer of lasagna noodles on top, tearing them as needed to fit. Spread 1/2 cup ricotta mixture on the noodles and scatter 1 cup vegetable mixture on top. Spread 1/2 cup pasta sauce over the vegetables and sprinkle 1/2 cup fontina, 1/2 cup mozzarella, 1/2 goat cheese on top. Layer the noodles, ricotta, vegetables, sauce and cheese three more times, omitting the sauce and cheeses on the last layer. Top with the remaining noodles, sauce and fontina. Transfer to the oven and bake until the sauce is bubbly and the cheese is melted and browned, 45 to 50 minutes. Sprinkle the remaining 1 tablespoon of parsley on top. Let the lasagna rest for 15 minutes before serving. This side dish is a very simple deconstruction of that classic French casserole potato dish, Pommes Anna, consisting of of thinly sliced potatoes that are layered and cooked in a generous amount of melted butter. 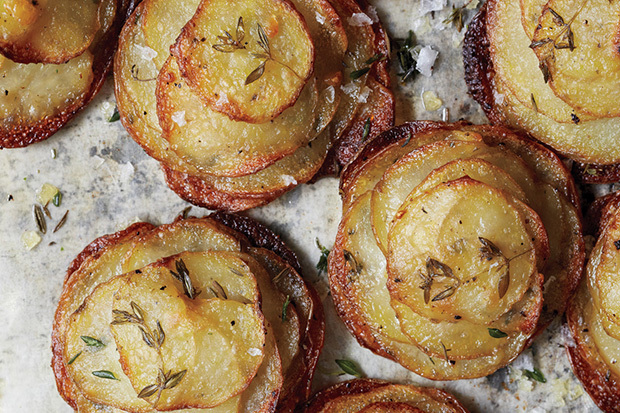 This version is presented as a single-serve dish with the classic French attitude.The more carefully you arrange the potato slices, the prettier the results and the better the individual-size cakes will hold together. They are perfect side dish to go along with baked chicken or even a slab of braised short ribs and they will be sure to impress your guests at the dinner table. Preheat oven to 350°F. Melt butter in a small saucepan over medium heat. Brush muffin cups all over with butter. Line bottoms with parchment-paper rounds. Arrange 1-2 small thyme sprigs in center of each round. Drizzle 1/2 teaspoon butter into bottom of each cup.Add chopped thyme and garlic to remaining butter in saucepan. Stir over medium-low heat until fragrant, about 2 minutes. Remove from heat.Using mandoline, slice potatoes crosswise into very thin rounds (less than 1/16″ thick), placing them in a large bowl as you work. Pour herb butter over and season with salt and pepper; toss to coat well.Divide potato slices among muffin cups, layering overlapping slices to create a circular pattern. Lightly press center of each to make compact. Drizzle any remaining butter and seasoning from bowl over.